This Billionaire Just Gave Up on AT&T, Inc -- Should You Follow? 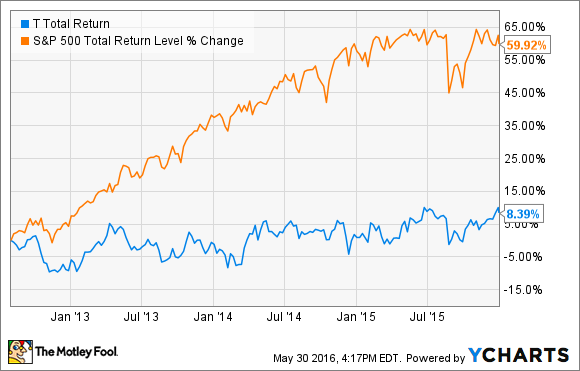 Early 2016 gave high rollers an easy way out of this difficult long-term holding. When billionaires sell shares, they tend to make waves. The Motley Fool would never advise you to follow every footstep of those market movers; but it doesn't hurt to see where the big money is flowing. Last quarter, seven billionaire traders sold off a total of $2 billion of their holdings in AT&T (NYSE:T). That amounts to just 0.8% of that stock's current market value; but some of these negative trades were very significant in the context of the seller's portfolio. One hedge fund, in particular, dumped all of its AT&T shares. I'm sitting up to take notice. In a review of recent Form 13F filings, where hedge-fund owners and other billionaires report their trades on a quarterly basis, several well-known hedge funds reduced their AT&T holdings in a big way. Bridgewater Associates, the world's largest hedge fund under the wing of billionaire Ray Dalio, used to park 1.2% of its assets in AT&T shares. During the first quarter, that stake was cut to zero. Yes, the fund sold all of its AT&T shares, amounting to at least a $1.65 billion sale. That figure would assume that all of Dalio's Ma Bell sales were done at the very-lowest price seen during the quarter; but that's a highly unlikely scenario, and the true sale value was probably somewhat higher. Many other high-roller hedge funds also reduced or closed out their AT&T holdings in the first three months of 2016. But their stakes were far lower then Bridgewater's, so this particular trade stands head and shoulders above the rest. Bridgewater is known for separating its investments into high-risk, high-reward Alpha bets, and calmer, but less exciting, Beta stakes. According to the latest 13F filings, AT&T no longer qualifies for either one of those distinctions. The company is swimming against the overall market currents. AT&T shares have gained a market-beating 13% so far in 2016, ahead of fellow telecom giant Verizon (NYSE:VZ), at 9.5%. The two-largest American telecoms delivered strong subscriber growth in the holiday quarter of 2015. Verizon pulled in 1.5 million new wireless subscribers in that quarter. AT&T's tally on that key metric rose to 2.2 million. The stocks surged on these earnings reports, and have not backed down from these lofty levels. Of course, that gave Bridgewater an elegant window for getting out of its AT&T holdings at a strong short-term profit. That's not always easy to do. The stock traded sideways from the summer of 2012 to the end of 2015, rising just 8%, and missing out on a 60% S&P 500 gain during the same period -- and that's with dividends reinvested along the way. AT&T is one of the most-generous dividend payers in that market index. The performance gap grows even wider if you forget about quarterly payouts. T Total Return Price data by YCharts. It looks like Bridgewater is giving up on its AT&T bets, and taking a rare opportunity to exit with at least a short-term profit on the books. Is that the right idea? Well, AT&T would tell you that the game has changed now that the company owns satellite TV provider DirecTV. That deal opens up avenues to international growth, with an established market in Latin America, and a brand-new portfolio of technologies. Personally, I think Ma Bell is fighting very hard to protect its existing American duopoly position, and the DirecTV opportunity will not be enough to make up for that crucial error. The wireless industry is changing around AT&T's ears, and the company is slow to adapt to the new reality. Instead, AT&T is doubling down on bandwidth restrictions for its landline broadband customers, with raised limits, but also tighter enforcement. My spider sense is tingling. AT&T is choosing to go down a very dangerous path, risking the loyalty of its current customers, and losing untold millions of potential future subscribers. Unless the company changes gears (and soon! ), this stock seems doomed to sink again during the next several years. If AT&T sticks to its guns, and my assumptions are on the right track, Ray Dalio will come out looking like a genius for having Bridgewater run a fire sale on its AT&T holdings in early 2016.